7 drawings on paper (1 sheet) : ink ; bottom image 3.875 x 6 in., on sheet 9.5 x 6 in. 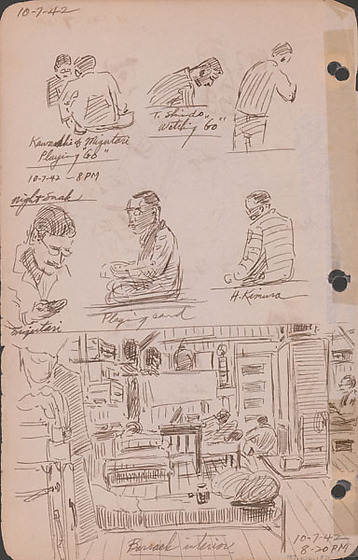 Ink sketches of seven men in various activities at 8 PM and a barracks interior at 8:20 PM on October 7, 1942. Top left sketch of two men, Kawasaki and Mizutani, playing Japanese chess game called Go. Visible from the waist up, one man wears glasses faces viewer while looking down at board, while other man has back to viewer. Top center sketch of a man, T. Shindo, in profile looking down as he watches a Go game. Top right sketch of a man standing with back to viewer with proper right arm partially drawn extended. Middle left sketch of a mustached man with eyeglasses, Mizutani, looking down at something in his hand ; visible from chest up. Middle center sketch of a man sitting in profile left playing cards. Middle right sketch of a man, H. Kimura, sitting with back to viewer. Bottom sketch depicting barracks interior. Metal framed bed in foreground ; two beds in background with one man lying down. one man is seated on floor in background in front of door to the left of large heating unit. Partially hidden man seated to right of heater, upper right. Trunks and other materials are stored along walls. Drawing 97.106.1FE on verso of same sheet. Written in black ink, top left corner: 10-7-42. Written in black ink on top left image: Kawasaki & Mizutani / Playing "Go". Written in black ink on top center image: T. Shindo / Watching "Go". Written in black ink on middle left image: Mizutani. Written in black ink on middle center image: Playing card. Written in black ink on middle right image: H. Kimura. Written in black ink on bottom image: Barrack interior, 10-7-42 / 8:20 PM.